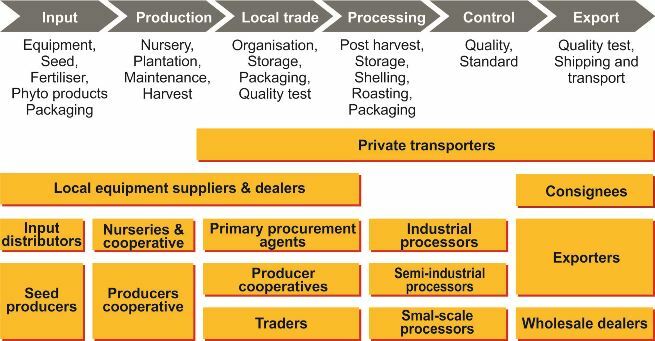 The subject of value chain analysis and competitive assessment is one of the main working areas of AFC. We have provided advisory services to numerous national authorities as well as private-sector businesses and food associations along the different stages of the food value chain. Furthermore, we have many years of experience in assisting the further development of the agro value chains worldwide, by supporting producers, establishing producer organizations, improving market structures, and supporting the introduction of quality management systems from “farm to fork” in line with EU and international standards. As comprehensive solutions from primary agricultural production to consumer protection become more essential every day, value-chain-based implementation methods are a basis in the framework of our pro-poor philosophy. Sustainability and quality management are thus core pillars of our approach. AFC has strong connections to the International ValueLinks Association, an independent network of practitioners working on value chain development and applying the methodological approach ValueLinks. Several AFC staff members are trained in ValueLinks and can apply this approach. We understand the importance of assessing and promoting the whole value chain in order to allow a significant progress at all stages.